Aktobe (Kazakh: Ақтөбе, Aqtöbe) is a city on the Ilek River in Kazakhstan. 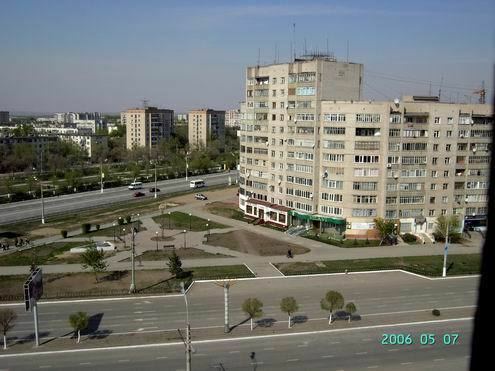 It is the administrative center of Aktobe Region. In 2013, it had a population of 371,546 people. The name "Aktobe" comes from Kazakh "ақ" (white) and "төбе" (hill); the name is a reference to the heights on which the original 19th century settlement was located. Until 1999 it was officially known as Aktyubinsk (Russian: Актюбинск). The former name is still commonly used in the Russian language, and by Russians in Kazakhstan. The territory of modern-day Aktobe Region has seen the rise and fall of many Central Asian cultures and empires. The region figured prominently in the history of the Kazakh "Little Horde". The Kazakh warlord Eset Batyr based his campaigns against the Dzungars from this area. His mausoleum is located 35 kilometres (22 miles) to the south of Aktobe city. Abulkhair Khan (1693–1748) was also based in this region. In March 1869, a Russian military fort with a garrison of 300 was built at the confluence of the Kargala and Ilek Rivers, along the Orenburg - Kazalinsk caravan route. From that period onward, Slavic settlers began to migrate to the region in order to farm, and very soon, neighbourhoods were built around the fort. In 1874 the fort was expanded in size, and streets were laid out to and from the fort's gate. In 1891 the settlement was labelled a district city, and officially named Aktyubinsk. In the late 19th and early 20th centuries the settlement rapidly expanded in size. While the 1889 population was listed as 2,600, by 1909 the population had increased more than four times to 10,716 official residents. The physical characteristics of the city had developed as well, and by the turn of the century the city had two churches, a seminary, a Tatar mosque, a Russian-Kyrgyz boys' school and girls' school, a clinic, a bank, a post office, a city park, a cinema and two mills. The Trans-Aral Railway was extended through the city in 1901. In the years leading up to World War I, industry began to develop in the town, including the construction of an electric factory, a brick factory and the establishment of an annual trade fair. The city was affected by the Russian Revolution of 1905, and strikes and riots took place between 1905 and 1907. Bolshevik revolutionaries were very active in the city, according to official Soviet histories. On January 8, 1918, the Bolsheviks moved to seize control of the local Soviet and by January 21, 1918, the Bolsheviks had secured the city under their control. With its location on the Trans-Aral Railway, Aktyubinsk was a strategic point, much contested between the Red Army and their White opponents during the Russian Civil War. Kazakh and Russian inhabitants of Aktyubinsk and its environs actively supported both sides in the conflict. In mid-1918, elements of the Bolshevik First Orenburg and Twenty-eighth Regiments, commanded by G.V. Zinoviev, were effectively besieged in Aktyubinsk by forces commanded by Ataman Dutov. Dutov, commanding approximately 10,000 rifles, 5,000 sabres, and 500 jigits (warriors) of the Alash Orda movement's newly formed Second Kazakh Mounted Regiment, attacked the city in October, 1918. The attack only reached as far as the village of Ak Bulak. In the autumn of 1918, Mikhail Frunze's Fifth Army and Mikhail Tukhachevsky's First Army were ordered to break through and clear the railway, in order to allow Red Army forces to link up with Bolsheviks along the Syr Darya. White pressure on Aktyubinsk was relieved by Frunze's capture of Uralsk, Orenburg and Orsk in early 1919, but by April Dutov and Admiral Kolchak were able to launch a combined counteroffensive. Aktyubinsk finally fell to the Whites on April 18, 1919, once again severing Bolshevik rail links to Central Asia. In this offensive, the Whites also managed to capture and execute Amangeldy Imanov, a Kazakh military leader who had been operating in the Aktyubinsk region with the support of Bolsheviks in Moscow. By June 1919, Frunze had received reinforcements and had moved back on to the offensive. On September 10, Aktyubinsk was secured by the Fifth Army after an eight-day battle. 20,000 of Kolchak's troops were captured, along with the easternmost part of the city. From this point, Bolshevik forces were able to control the railway to Tashkent. An All-Kazakhstan Conference of Soviet Workers was held in the city on March 13, 1920. This was the first of a series of regional organizing conferences held by the Bolsheviks that ultimately led to the creation of the Kirgiz Autonomous Soviet Socialist Republic - the entity that would ultimately develop into the Soviet Republic of Kazakhstan. In 1932, Aktyubinsk was named capital city of Aktyubinsk Region. The city developed extensively during World War II as a result of the evacuation and reconstruction of factories from Ukraine and from Moscow, including a worker's cooperative, a ferroalloy factory, and an X-ray factory. Chromium also began to be mined and processed in the region. In the 1960s, an extensive expansion of the city was undertaken by Soviet authorities, resulting in the construction of a city center and a sports stadium. The city's society and economy have dramatically changed since Kazakhstan's independence in 1991. Older heavy industries have declined and been replaced in importance with the energy sector. The city has continued to expand with new construction and with many Kazakh immigrants moving to the city from the surrounding countryside. In 1999, the official name was changed from Aktyubinsk to Aktobe by presidential decree, as part of a nationwide effort to support the Kazakh language. On May 17, 2011 Aktobe was the site of one of Kazakhstan's first terrorist attacks, when a suicide bomber blew himself up in the headquarters of the local national security services. Some analysts have interpreted this as a sign of increasing instability in the oil-rich, but socially unequal, region. Further attacks by suspected Islamist militants occurred on June 5–6, 2016. Aktobe Region is located in Western Kazakhstan, and is the second largest region by area in Kazakhstan. The city of Aktobe is located where the Kargala and Ilek rivers meet. It is in the north-central part of Aktobe Region. The Russian city of Orenburg is located some 200 kilometres (120 miles) to the northwest, while the Russian city of Orsk is about 150 kilometres (93 miles) to the northeast. The area around the city of Aktobe is mostly flat steppe, with low hills rising to the northeast. Other rivers, such as the Emba and the Ural River, flow through the region. The region is bordered on the south by the Aral Sea. 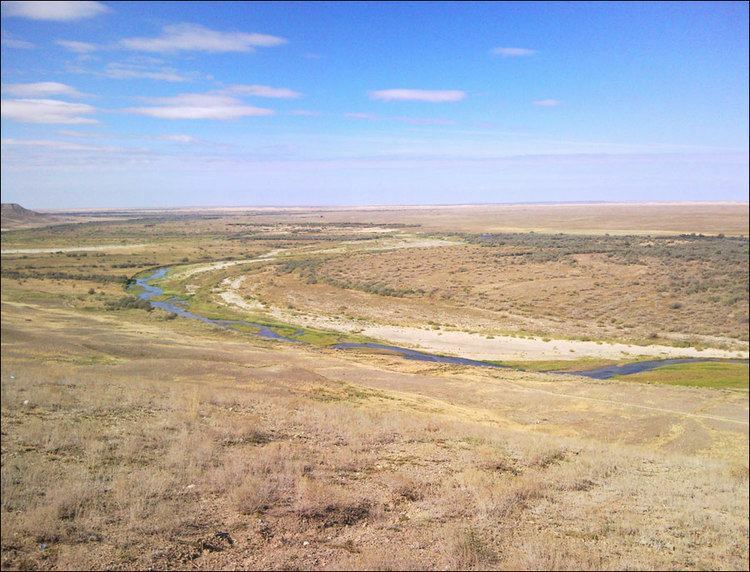 The natural vegetation cover around Aktobe city is steppe, while the southern parts of the region are semi-desert. Aktobe has a humid continental climate (Köppen climate classification Dfa), with wide seasonal variations in temperature. In winter, temperatures can reach a low of −48 °C (−54 °F), with a daily average minimum of −16 °C (3 °F). Summer temperatures can reach a high of 43 °C (109 °F), with an average maximum temperature of 30 °C (86 °F). The weather can change rapidly, especially during spring and autumn (the especially windy days in March when the weather changes are known locally as the Бес Қонақ, or "Five Guests"). Precipitation usually occurs in early spring and late autumn/early winter, and is otherwise sporadic throughout the year. Overall, Aktobe receives about 330 millimetres (13 in) of precipitation per year. While Aktobe Region is the second-largest region in area in Kazakhstan, it has the lowest population density of 2.6 people per square km. In 1985 it had a population of around 231,000. By the results of 2012 estimation population of the region was 796,100 people, and over 420,778 people lived within the city of Aktobe. While the census does not enumerate ethnic breakdowns by region, Aktobe and Aktobe Region would appear to host a large Kazakh ethnic majority (55.6%). Russians are the second-largest ethnic group (23.7%), and smaller ethnic groups also inhabit the region, especially the city of Aktobe. Among these are sizeable Ukrainian, Tatar, Chechen, Armenian, Jewish, and Greek populations, among many others. The Volga Germans once maintained a large community in Aktobe, but since the early 1990s many of their number have emigrated to Germany. The population in this region is very mobile, and concrete numbers and percentages can rapidly become obsolete. 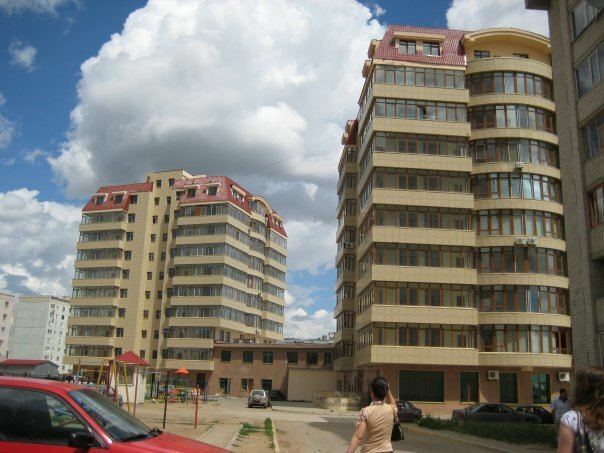 Aktobe has a fast-paced apartment-building boom, possibly due to the expansion of the oil industry and immigration from nearby villages. The construction boom is connected with the general economic growth in the region and in Western Kazakhstan. Aktobe is the capital city of Aktobe Region. An akim (governor) is appointed by the President of the Republic of Kazakhstan to act as chief executive. Aktobe has both the region and the municipal government (whose chief is also called Akim). The Municipal akim is appointed by the regional akim. Region headquarters for the Kazakh National Security Committee (KNB), the Ministry of Foreign Affairs and for the Registry of the Republic of Kazakhstan are located in Aktobe. Aktobe is the Headquarters for the Western Military District of the Republic of Kazakhstan. This district's responsibilities include defence of the Caspian Sea region, and the district is commanded by a Rear-Admiral. A Russian military presence is maintained in the region at the Emba missile testing range. Agriculture and ranching play a large role in Aktobe Region's economy and in rural employment. Beef, mutton and dairy products are major products in this area. Heavy industry was established in Aktobe during the Second World War. Many of today's fastest-growing industries in Aktobe are related to food production (such as the company "Ramazan"), construction ("Dastan") or vodka distilling ("Wimpex" and "Ayazhan"). A number of foreign companies, notably German and Austrian firms, have established partnerships with local light industry firms. Both copper and chromite are mined in the Khromtau district of Aktobe Region. However, the major engine of economic growth in Aktobe and Aktobe Region has been the development of energy resources. The Chinese National Petroleum Company (CNPC) owns a 60% stake in AktobeMunaiGaz, and is investing heavily in oil and natural gas extraction from Aktobe Region oilfields. A pipeline has been constructed to transport oil to Xinjiang (see Energy and Utilities). The revenues from oil and gas extraction have helped to develop banking, real estate, and support services in Aktobe. The region also possesses large deposits of phosphorite. One of the largest known being Chilisai deposit, the British company Sunkar Resources Plc (2008) has built an integrated production facility to develop one of the lowest cost producers of phosphate fertiliser in the world with its Chilisai Project (800Mt of ore averaging 10.5% P₂O₅). Aktobe is host to a number of state and private institutions of higher learning, including Zhubanov State University and the West Kazakhstan Medical University. The military of Kazakhstan also maintains a pilot school in the city. During the Soviet Era many pilots were trained there. Aktobe art school is one of the most respected institutions which work together with UNESCO. 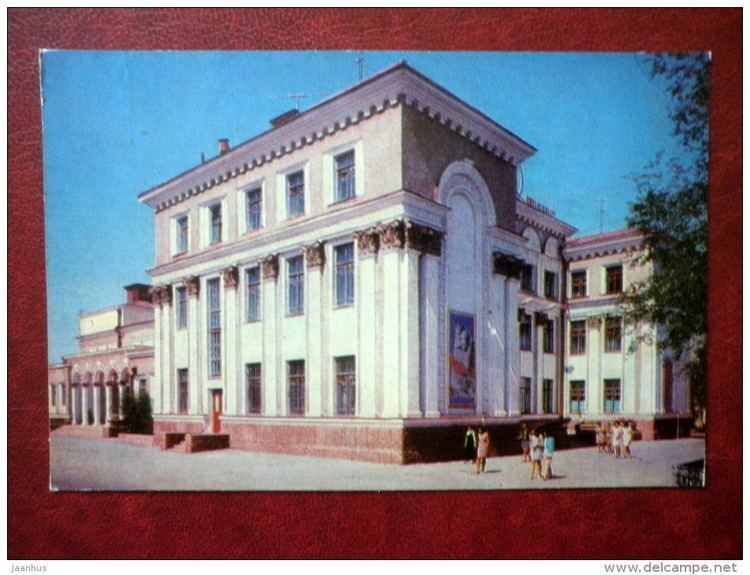 There are two theaters in Aktobe, as well as one Children's Palace theater. There are also two museums in Aktobe: the Regional Museum, dedicated to the natural and human history of Aktobe Region, and the Aliya Moldagulova museum. There is also a geological exhibition in the city. Two Russian Orthodox churches are located in Aktobe, three mosques, with the third mosque completed in 2006, as well as a Catholic and a Pentecostal church. There are a large number of outdoor bazaars and indoor shopping centers located across the city. Most unusually, a major indoor shopping center shares space with the Nurdaulet mosque in the city Center. The city sent a bandy team to the Spartakiade 2009 and is home to football club FC Aktobe. Aktobe maintains daily international rail service with Moscow (via Saratov), Bishkek, and Tashkent, as well as daily domestic service to Aktau, Atyrau, Almaty and Astana. Aktobe Airport offers daily flights to Moscow, Almaty, Astana, Aktau, Atyrau, and Baku. Bus service connects Aktobe with villages in Aktobe Region and across the border with Russia. The Aktobe Field has an estimated reserve of 1.17 billion barrels of crude oil, and is being developed by the CNPC/AktobeMunaiGaz consortium. Smaller German and American joint ventures are also involved in oil extraction projects in the region. Major oil and natural gas pipelines transect Aktobe and the surrounding region. The 400-kilometre (250-mile) Keniyak-Orsk pipeline, with an annual capacity of 7.5 million tons, carries oil from the Aktobe fields to a refinery in Orsk, Russia. The Kazakhstan-China Pipeline has transported oil from Aktobe's fields to Atyrau since 2003. The Keniyak-Kumkol phase of the pipeline is scheduled for completion in 2011, and will link Aktobe's oil fields to the current Atasu-Alashankou pipeline supplying crude oil to Xinjiang. Aktobe is connected to the Bukhara-Urals natural gas pipeline. The VII Asian-Pacific Astronomy Olympiad took place in Aktobe in November 2011.